Size: approx. 2 mm. Photo: 06/26/14, 7 pm. 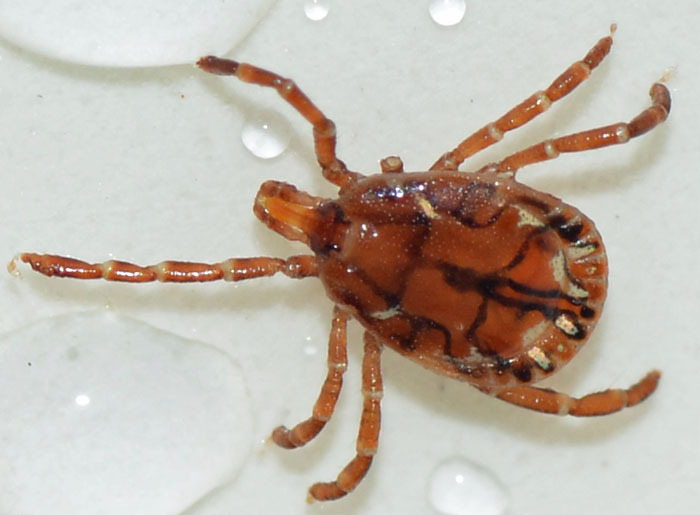 I believe this is a male lone star tick (A. americanum) or a gulf cost tick (A. maculatum). In any case, I found it crawling on my hand after a "photo shoot safari" into my backyard, brushed it off into a sink, and took this photo before ... well you can guess. I was surprised to read in the WSJ that bites from the lone star tick can make humans allergic to red meat (see 2nd link below). This reaction occurs weeks or months after the bite and 3-6 hours after eating the meat. Symptoms include vomiting, abdominal cramps, hives, and anaphylaxis.